Normally, GST is to be collected by the person who is selling good and services. But in some cases GST is to be collected by the purchaser of goods/service and not by seller. This is called Reverse Charge Mechanism, RCM in short. In some cases of sale through E-commerce operator such as Uber, ola etc the tax is not collected and deposited by seller but collected by e-commerce operator. Such cases are not called reverse charge. In which Cases RCM is applicable? Notification No.8/2017 – Central Tax (Rate) This notification exempts RCM under section 9(4) up to Rs. 5000 per day. Notification No. 38/2017 – Central Tax (Rate) This notification remove limit of rs. 5,000 up to 31 Mar 2018. i.e no RCM under section 9(4) applicable. Notification No. 10/2018 – Central Tax (Rate) This notification extend date of exemption to 30 June 2018. Notification No. 12/2018 – Central Tax (Rate) This notification extend date of exemption to 30 Sep 2018. Notification No. 22/2018 – Central Tax (Rate) This notification extend date to exemption to 30 Sep 2019. When a registered person purchases any goods or services from an unregistered person then such registered person has to pay GST on reverse charge basis. An unregistered dealer can not make inter state sales, therefore such sales is always intra-state sales. Although the government has given an exemption of Rs. 5,000 per day. Therefore if a total purchase of less than Rs. 5,000 is made in one day from unregistered person then there is no requirement to pay tax on RCM. This limit is total of Rs. 5,000 from all suppliers and not per supplier. Notification No. 8/2017 Central Tax (Rate). The registered person has to print a self invoice. For some products/services, reverse charge is specifically provided. In such cases reverse charge is payable by the receiver even if the seller is registered person subject to the conditions specified for such product/service. The person who is required to pay tax under RCM under this head has to register irrespective of threshold limit. The seller of services/goods on which covered under this point are required to mention in their tax invoices that GST is payable on reverse charge. Example – A trader who is registered in GST takes services of Goods Transport Agency (GTA) for Rs. 10,000. This service is listed under the reverse charge list therefore trader has to pay tax @ 18% on Rs. 10,000 on RCM. However such GST paid is also allowed as Input tax credit in same month and therefore net liability of tax will not increase. A complete list of such goods and services is given at end of this article. The rate of tax to be used is the rate which is applicable on such goods/service. GST Compensation Cess is also applicable on reverse charge. If the goods/services purchased in exempted or nil rated then no tax is payable under RCM. Composition dealers are required to pay reverse charge at normal rates (5%,12%,18%,28%) and not at the composition rates (1% or 5%). Any amount paid as reverse charge is allowed as input tax credit subject to condition that credit is allowed in normal circumstances to such business. For example composition dealers are not allowed to take input tax credit in normal circumstances and therefore they are also not allowed to take input tax credit on gst paid on reverse charge. Also the amount of GST under Reverse charge is to be paid in cash only and can not be paid from ITC available. The net result is that minimum amount of GST payable in a tax period is the amount of reverse charge in that period. A registered person liable to pay tax under reverse charge (both for supplies on which the tax is payable under reverse charge mechanism and supplies received from unregistered persons) has to issue an invoice in respect of goods or service or both received by him. Such a registered person in respect of such supplies also has to issue a payment voucher at the time of making payment to the supplier. There is no specific format for such self invoicing. The same format which the person is using for invoicing can be used only heading is to be changed. 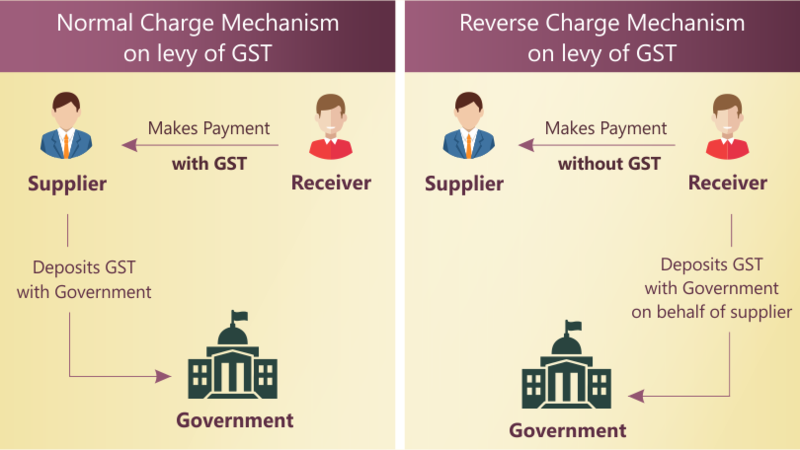 For the levy of Reverse Charge under GST, it is very important to ascertain the time of supply as GST would be required to be deposited with the Govt within 20 days from the end of the month in which the services were provided. The date immediately after 30 days from the date of issue of invoice by the supplier. If it is not possible to determine the time of supply under (a), (b) or (c) above, the time of supply shall be the date of entry in the books of accounts of the recipient. The date immediately after 60 days from the date of issue of invoice by the supplier. If it is not possible to determine the time of supply under (a) or (b) above, the time of supply shall be the date of entry in the books of accounts of the recipient. (f) any partnership firm whether registered or not under any law including association of persons. 5. – Supply of lottery State Government, Union Territory or any local authority Lottery distributor or selling agent. Explanation.- For the purposes of this entry, lottery distributor or selling agent has the same meaning as assigned to it in clause (c) of Rule 2 of the Lotteries (Regulation) Rules, 2010, made under the provisions of sub section 1 of section 11 of the Lotteries (Regulations) Act, 1998 (17 of 1998). Previous How to make changes in the TDS challan details paid online or offline? Can you let me know the rule? I bought a flat under construction and is still under construction. If I get my money back (refund) with interest, is any GST applicable for this transaction? Let me know the rule if any. Are you asking that you will get a refund of GST paid by you to the builder? If you are asking this then the answer is No, you can not get refund of GST paid. GST is applicable on under construction flat.